We noticed something in a Microsoft Office support article that concerned us recently. This is good news on the surface because it’s not a proprietary standard and is supported by a plethora of software applications and online hosting sites such as YouTube and Vimeo. But, all is not entirely clear. Videos in the .mp4, .mov, and .qt formats can be played in PowerPoint  if the Apple QuickTime player is installed. So, if you want the best video playback experience in PowerPoint 2013 and only in this version, then it makes sense to use MP4. But if you need portability and guaranteed no hassle playback for everyone that you send your file to, we think you’d be better off using the legacy Windows ‘standard’ format of WMV is it doesn’t have third party dependencies which you have to explain to the recipients of your work of art. The table below is a summary compilation of the Microsoft declared video compatibility for various versions of PowerPoint. There are several caveats regarding playback quality and compatibility. Read more about these in the individual Microsoft Office pages under the References section below. 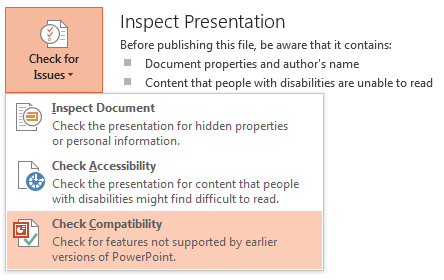 Now, given PowerPoint has had a cross-version compatibility checker feature integrated for a while now, you’d think that the above kind of issue would be highlighted when you used it. You’d be wrong. Why? 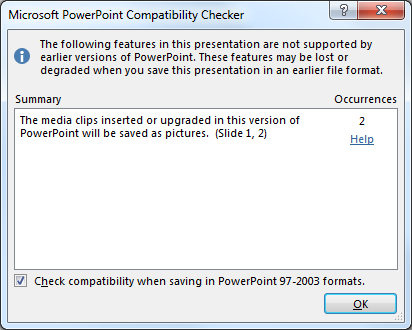 Because the compatibility checker only considers the differences either side of the major upgrade between PowerPoint 2003 and 2010 as stated by Microsoft! It’s a pity that Microsoft don’t declare what the Check Compatibility feature is actually checking at this stage because “Check for features not supported by earlier versions of PowerPoint” is not what it’s doing! Because this feature is aimed at creating compatibility for HTML5 publication (a browser technology that aims to replace Flash on devices such as iOS and Android) it’s likely that this won’t help the backwards compatibility with PowerPoint. 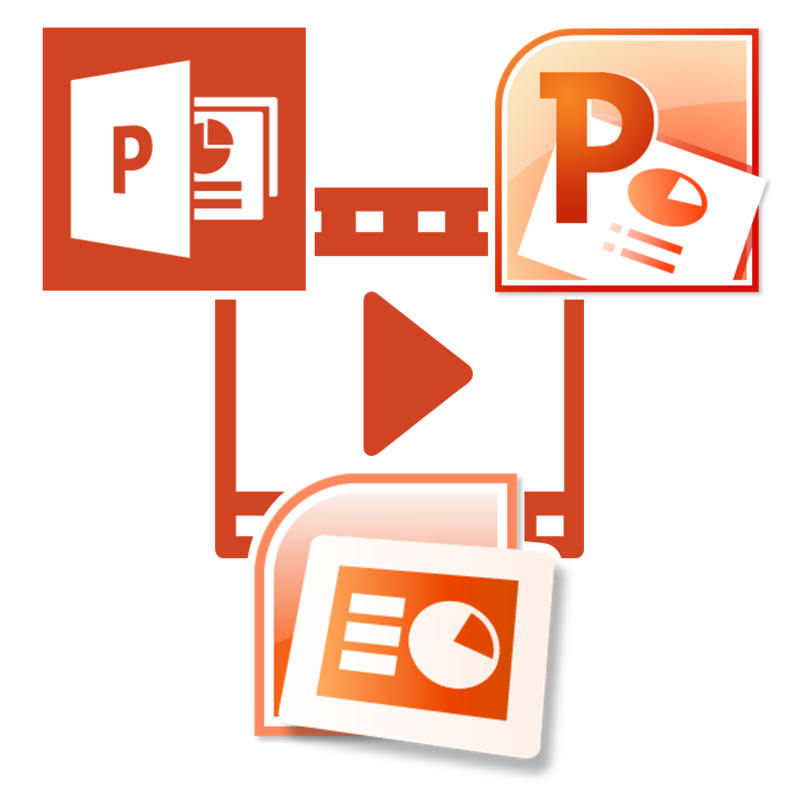 Besides converting MP4 to PowerPoint, it also helps to convert any other video formats including MOV, M4V, FLV, F4V, MKV, 3GP, WTV, DVR, MXF, Apple ProRes, RMVB, DV, VOB, MTS, AVCHD, OGV, WebM, and etc to PowerPoint video or audio format. It even supports to convertFLAC, OGG, APE, 3GA, M4A, M4B, QCP, VOC, DTS, RA, AC3, CAF and etc to PowerPoint compatible AIFF, MP3, WMA, WAV, AU.